Since Circle’s acquisition of Poloniex, we have focused on bringing an array of diverse and compelling assets to the exchange. We judge a listing’s merit not just by the volume in which it trades, but by its potential to move the blockchain space forward. This includes nascent assets with strong fundamentals, technology, people, business models and market dynamics supporting them. Today, we’re delighted to be the first exchange to support FOAM; a recently unlocked token that meets the criteria we set forth in our Asset Framework. Deposits and withdrawals are currently live. Additionally, customers can now post limit orders, but orders will not be matched (“Post-only”) for a minimum of 1 hour. Post-only mode allows the order books to fill before we open trading so that we can avoid dramatic price swings and ensure a healthy market. Full trading in BTC and USDC pairs will be enabled later today. The FOAM protocol is empowering a consensus-driven map of the world. It introduces a system that provides “Proof of Location”. This allows users and autonomous agents to privately record authenticated location data independent of external centralized sources such as GPS, among other use cases. FOAM is the native token of the FOAM protocol and powers a variety of services centered around geospatial data, such as participating in a Token Curated Registry of verified location data. While the FOAM network launched in September 2018, FOAM tokens have been locked by the protocol and were non-transferable during an initial Proof of Use period. This period has ended today, and tokens may now be transferred on the Ethereum blockchain. You can read more about FOAM here and at @foamspace on Twitter. 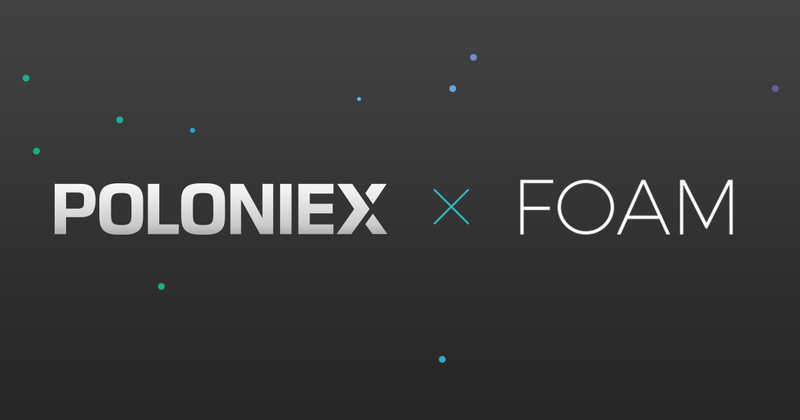 The addition of FOAM to Poloniex on the launch of its availability represents another milestone for our team this year. Thank you for your ongoing support as we grow the Poloniex family of assets to include new, innovative projects. With more exciting announcements to come this month, please follow the Circle Blog on Medium and @Poloniex on Twitter to learn about future developments. Originally published at blog.circle.com on December 10, 2018.